Ninety youths of Tamil, Sinhala and Muslim communities participated in the month long programme, the first in the northeast province organized by the SLRC, sources said. Awarding of certificates to participants of the third and final batch of 30 participants took place Sunday. Mr.Patrick Walder, Head of Sub Delegation of the International Committee of the Red Cross (ICRC), and Mr. Daniel Fueger, delegate of the ICRC in Batticaloa also attended the event. Mr.J.Karikalan, Project officer of the SLRC, Trincomalee district branch presided. Dr.Gnanagunalan, the president, SLRC Trincomalee district branch. Mr.S.H.Nimalkumar, National Secretary of the SLRC, which has its headquarters in Colombo speaking at the event, said SLRC earlier engaged in providing humanitarian services during the war period. 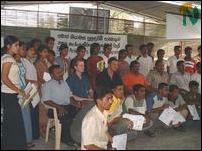 SLRC Trincomalee district branch was established in 1989 following the outbreak of ethnic violence in the eastern district. It organized several projects to alleviate the suffering of the internally displaced in the district. Mobile medical clinic project launched by the SLRC Trincomalee district branch is still continuing. SLRC decided to launch another project of promoting harmony among communities and to support the process of peace building from the grass root level of the society following the signing of the ceasefire agreement between the Government of Sri Lanka (GOSL) and Liberation Tigers of Tamil Eelam (LTTE), said Mr.Nimalkumar. As a prelude to this the SLRC launched a training programme for youth and social animators supported by the USAID. "We selected ninety youths, thirty from each community and have trained them to work as social animators in their respective areas instilling in the minds of the people the urgent need of strengthening the unity and safeguarding the current peace environ. Today the final batch of trained youths is leaving to their villages," said Mr.Nimalkumar. He appealed to the trained youths and social animators to organize camps in their respective villages to create awareness among the population stressing the necessity of promoting harmony. ICRC Trincomalee sub-delegation head, Mr.Patrick Walder. Dr.E.G.Gnanagunalan, President of SLRC Trincomalee district branch said it is in the hands of these trained youths to make the district a place for all communities live in peace and harmony in future. Mr.Patrick Walder also spoke. Representatives of each community spoke about their experience gained by attending the seminar at a time when all three communities are yearning for permanent peace in the country. SLRC National Secretary Mr.Nimalkumar speaking at the event. Sitting from left, Ms.Daniel Fueger of Batticaloa ICRC, Mr.Patrick Walder of Trincomalee ICRC, Mr.Manivannan and Mr.Karikalan of SLRC Trinco branch.